Ah, the mid-week, mid-afternoon lunch. It's a wonderful time to be lazily perusing a menu; taking time over a coffee; stretching out a conversation over repeated top-ups of table water. And A Minor Place is as funky and fitting a venue for these activities as you could wish for. The cafe uses organic bread and eggs, and takes some care to make standard cafe offerings a little bit unfamiliar. I did notice, to my chagrin, that their french toast has changed. Since it is pistachio season I should use that as an incentive to get some fresh nuts and cheese and whip up my own batch of pistachio ricotta. 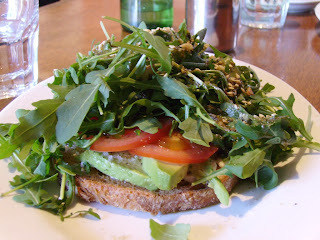 My lunch choice was the Xanadu toast: The riot of green rocket covered fresh tomato, wonderfully thick wedges of avocado, and chevre, all sitting atop two pieces of aforementioned organic bread. The bread held its texture well, especially given the sandwich was drizzled with pesto oil. A good sprinkling of dukkah completed the flavour spectrum. It was quite delicious and met my late lunch requirements aptly. My dining partner went with the fabulously titled 'Forget About It' meatball wrap. Try ordering it without either a straight face or a New York accent! 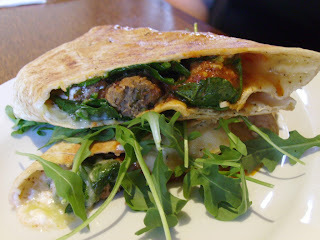 The wrap came with tomato sugo, spinach and yoghurt. Rocket was rather more prevalent than spinach, and I would call that pocket bread, rather than a wrap, but they're very minor points (about a clearly ironically named Minor Place!). Each of the ingredients was subtle, but fresh, which meant they worked together to create a fulfilling lunch dish. A Minor Place has had a development application in the window indicating that they are going to become licenced. If one can linger as contentedly as we did over a plate of food each and a coffee, imagine what a glass or two of wine will do!